Real Green’s user conference, “Solutions 2017: The Magic of Marketing,” ended Jan. 13 with attendees abuzz about how much they learned. The launch of its new software, Service Assistant (SA) 5, has many enhancements and features; several breakout sessions were devoted to training and maximizing them for individual pest management and lawn care companies. 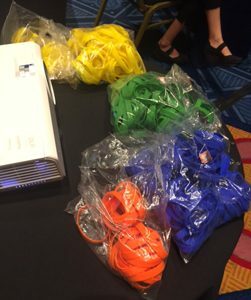 When the color bracelets came out, we knew we were in for something interesting. “I talk to way too many people who only send statements when it rains,” lamented Andy Yavello. Invoice at time of service. Educate the customers on the price of their programs, so there is no misunderstanding when they receive their invoices. One attendee noted that recording every phone call that comes into the office has been beneficial, as there have been instances where a wife calls to complain she did not authorize a service, yet can be sent a .wav file of her husband’s voice on a previous call doing exactly that. Train your staff to keep after delinquent payments. Fred Haskett noted that add-on services can generate high gross margins (+/- 50 percent) and usually are total of 20 percent to 30 percent or more of the annual contract value. Fred Haskett, a consultant with The Harvest Group, joked that he “had a 42-year internship to become a consultant.” His landscape and pest management experience has made him more than qualified to talk about add-on services. 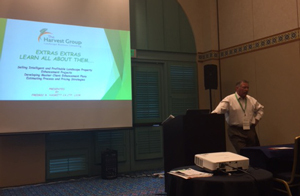 To that end, Christmas Decor Franchise Consultant Mike Donahue gave a mini “Discovery Day” presentation to attendees of his session, noting how holiday lighting business can boost revenue during the off season. “We not only help you diversify services, but attract affluent clients,” Donahue said. 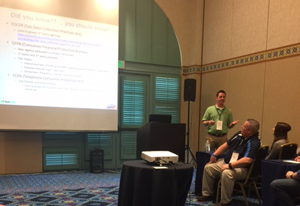 The last session I attended before the Vendor Reception was presented by Bell Labs’ Patrick Lynch. He planned to present rodent basics to lawn care professionals looking to expand their services, but many of the sessions’ attendees were pest management professionals looking to expand their rodent knowledge. Lynch addressed both groups. 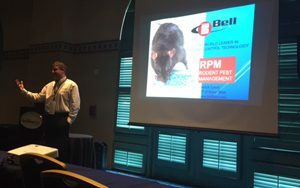 Bell’s Patrick Lynch noted that new industry labeling is giving professionals the opportunity to add voles to their rodent repertoire. This story was written by Heather Gooch, editor of Landscape Management‘s sister publication, Pest Management Professional.